Give your little math whiz a wordy challenge! This word scramble will help him hone his spelling skills while reviewing common math terms. He'll also be honing his logic and reasoning skills, which will help him excel in advanced math. Exercise your child's mind and his vocabulary with this challenging word scramble. He'll use his logic and reasoning to figure out each word. Have fun reviewing different career words with this word scramble! It's time for a fun word challenge! This word scramble will help your child build her spelling skills, as well as basic problem-solving skills. Star soccer players will love solving this sporty word scramble! Review some soccer words as you hone spelling and vocabulary. Have fun solving a Christmas word scramble! Your child will get to hone his vocabulary and spelling, all in the holiday spirit. Treat yourself to a tricky word scramble this Halloween! Your child can practice his spelling and vocabulary as he figures out each spooky word. This word scramble is full of kitchen words that need to be rearranged and spelled out correctly. Practice the root word TELE with this word play worksheet, perfect for strengthening vocabulary skills. Challenge your child with this egg-cellent word search featuring words that are all about Easter. 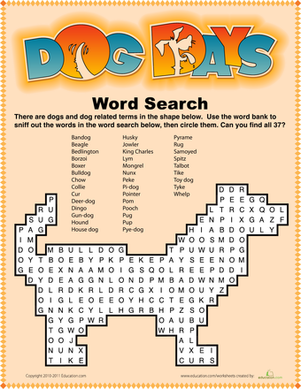 Practice geology vocabulary with this challenging word search.